Having a dinner party? It's time to get out your best plastic! In the 1950s and early 1960s it seemed that melamine tableware might replace traditional ceramics in the dining room, as well as for picnics. These plastic impostors were made from Melamine Formaldehyde. It was tough, the manufacturers claimed, almost unbreakable. It could be moulded into contemporary shapes and be bright and colourful - 'gay' to use a term from the era. Melamine was developed just before the War in both Germany and America. It is the material Formica is made from. Plates and cups made from Melamine were durable and if you dropped them on the floor, they had a good chance of surviving. In the fifties and sixties, Melamine worried the manufacturers of ceramics so much that Midwinter even introduced its own Melamine range - Midwinter Modern. However, although claims for its durability were true, it was not totally indestructible and unfortunately, Melamine cups were stained by tea and coffee. 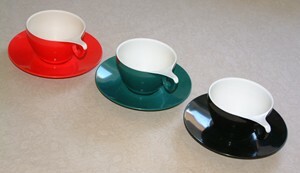 This was especially obvious on the two-tone cups and bowls with a white lining. In the end, it failed to unseat traditional ceramics and was still preferred only for picnics and camping by most people. The real reason, perhaps, was that although plastic tableware was initially expensive, and enjoyed a brief spell of being fashionable, it could never have the prestige of ceramics in the eyes of the public. In the end it was always going to be mass produced. Still plastic tableware was bright and fun. The trend for eating outside - especially in the summer is bringing Melamine back. Habitat currently stock a colourful range. The best place to shop for Melaware online is eBay. Melamine cups and saucers are a real bargain, given the iconic style and the significance of Melamine to fifties lifestyle. You should be able to pick up a good set for less than £20 and individual cups and saucers for £2 or £3 each. Study the design carefully if you want to be sure of genuine Melaware. Some sellers use 'Melaware' as a generic term for everything made of melamine. Look out for 'Gaydon Melaware' in descriptions: Gaydon made Melmex not Melaware, they are different companies and different products. 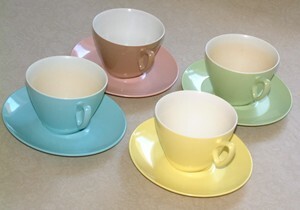 These cups in pastel shades are branded Gaydon. They were made by British Industrial Plastics (BIP) - the manufacturer of Melamine. They also share the organic style of the Melaware cups. The design, by A H Woodfull, dates from 1961. It was made until 1966. Colours were turquoise, pink blossom, apple green, haze blue and primrose. These shades were popular in the early sixties. Brighter colours once again took over later in the decade. People would often mix and match colours buying several to create a fun dinner or tea service. 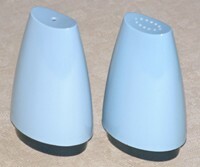 The range also included these stylish salt and pepper pots. You can buy Gaydon on eBay. Gaydon Melmex was well designed and the colour scheme very much in tune with fashionable household interiors in the 60s. Like Melaware, it is a bargain You should be able to get a set for around £20 and individual pieces for £2 or £3. Concern about being left behind if the market shifted entirely to plastic prompted Midwinter - a leader in contemporary ceramics - to introduce the Modern range of Melamine tableware in 1957. 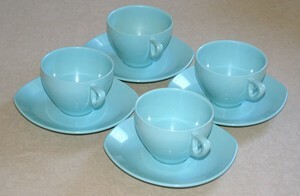 The saucers are a rounded off square shape, similar to some of Midwinter's ceramics from the 50s. Melamine tableware persisted into the 60s and 70s. 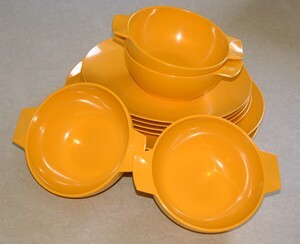 This bright yellow set is an example of the later style. Here the lugs on the bowls suggest that this tableware is aimed more at the picnic or camping market, than the dinner party.